Eva Privett is the daughter of James Morton, who was the son of George Washington Morton and Mariah Gearhardt. Mariah Channing Gearhart (nee Morton) (grandmother of Eva Privett) was born May 16, 1855. She was the daughter of George Washington Gearhart, Sr. and Sarah Roberts. Around 1878, she married George Washington Morton and had six children. Mariah Gearhart Morton passed away in 1948 in Evansville, IN at her daughter Sadie/Sarah's home and is buried in New Hope Cemetary. Mariah's sister, Isabel Gearhart, also joined the Morton family, marrying David Ira Morton's brother, George Washington Morton (i.e the uncle of Maria's husband, also named George Washington Morton). Isabel's George was supposedly killed in an argument over a cornfield, leaving Isabel a widow for a second time. She apparently had been married before as she is listed as Isabel Norris in the 1880 census, living at her brother's house with her 17 year-old son, Sterling Norris. James Roberts, Jr. (great-great-grandfather of Eva Privett, father of Sarah Roberts Gearhart) was born on 1820 in Jackson County, Tennessee. Johann Valentine Gearhart, Sr. (great-great-grandfather of Eva Privett, father of George Washington Gearhart, Sr.) was born March 2, 1775 in Philadelphia County, Pennsylvania. Johann was the son of Peter Gearhart and Margretha Anna Wolffskihl and was Christened May 14, 1775 at St. Luke's Reformed Church at Trappe, Pennsylvania. The nickname for Valentine is Felty, pronounced Velty in German. In 1807 Valentine was recommended by the court of Franklin County, Virginia., to the governor of Virginia as an ensign in the Virginia Militia - 2nd. Battalion - 43rd. Regiment. He was named to replaced his brother who had died in 1807. (Most likely William). Valentine lived on land he owned on the headwaters of Pigg River in Franklin County, Virginia in the cove of Dugspur Mountain. There are many land deeds recorded in Franklin County deed books for Valentine Gearhart. In 1812/1814 Valentine sold his land in Franklin County to Fleming Saunders, and moved to Overton County,Tennessee to the north side of the Obey River. Home or homeplace that he built is known as Jake Gates Place. His first wife is burried there. He then moved to Fitzgerald Place. There he married Nancy Chowning. He was listed in the tax records of Overton County, Tennessee. in 1820. Sometime later he moved to Celina, Clay County, Tenn, where he passed away on December 26, 1835 and was buried in Roberts Cemetery, on a left turn street going east out of town. He married Exony (Exonia) Packwood on March 11/25, 1802 in Patrick County, Virginia and had 9 children. Exony/Exonia/Sony Packwood (great-great-grandmother of Eva Privett, mother of George Washington Gearhart, Sr.) was born around 1782 in Massachusetts or Virginia. She married Johann Valentine Gearhart, Sr. on February 11/25, 1802 in Patrick County, Virginia and they had 9 children (see above). Richard Packwood - Born 1771 MA? ; married 10 DEC 1803 Patrick Co.,VA to Nancy Spaulding. Larkin Packwood - Born 1772 MA? ; died 1862; married (?) Henderson. Elisha Packwood - Born 1773 MA? d.1865 Old creek,CA; first wife (? ); married second wife 25 Jan 1798 in Patrick Co., VA, Mary Polly Burnett. This family went to Clark Co.,IN in 1820. Samuel Packwood - Born 1775 MA? d.1848 mar. 5 MAY 1800 Franklin Co.,VA; first wife Judith Sneed; second wife Isabel McKinley. Racheal Packwood - Born 1780 MA? d.1855 mar. 23or28OCT1802 Patrick Co.,VA John Smith. Exonia (Sony/Exony) Packwood - Born abt.1782 MA?/VA? d. Before 1824 mar. 25FEB1802 Patrick Co.,VA Valentine Gerhart. This Family possibly went to KY.
Mary Packwood - Born abt.1784 VA Mar. Edmond Bartlett. 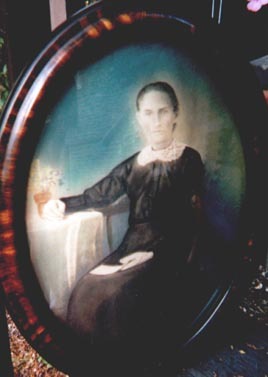 Edith Packwood - Born abt 1785 VA; married 10 FEB 1813 Patrick Co.,VA to John McCuthins. This family went to KY.
Sarah Packwood - Born abt 1788, VA d.before her father in 1824; married (?) Bartlett, presumed to be brother or relation to her sister Mary Packwood's husband Edmond Bartlett. William Packwood - Born in England; died 1801 in New London, Connecticut. Son was Elisha Packwood, granfather of George Packwood who was reputedly a General for the Confederate Army during the Civil War. However, the only record I have found for a George Packwood was as a Captain for Company K, 4th Louisiana Infantry who spent a year as a prisoner of war in 1864/65. Abraham Gearhart b. 1764 in Philadelphia Co., PA, d. May,1800 ? Margretha Anna Wolffskihl (great-great-great-grandmother of Eva Privett, wife of Peter Gearhart) was born November 18, 1744 in Hueffelsheim, Kreuznach, Rheinland,Prussia and passed away in 1802 in Franklin County, VA. Margretha was the daughter of (unknown) Wolffskell and Anna Maria Viel. Margretha was christened at Evangelisch, Hueffelsheim, Rheinland, Preussen/Prussia. She married Peter Gearhart in 1761 in Berks County, Pennsylvania and they had 12 or 13 children (see above). Elizabeth Dudley (great-great-great-great-grandmother of Eva Privett, wife of Leonard Gearhart) was born February 9, 1708 (1712?) in Exeter, Rockingham County, New Hampshire and passed away in 1777 in Philadelphia County, Pennsylvania. She was the daughter of Stephen Dudley and Sarah Gilman. She married Leonard Gearhart and had seven children (see above). George Gearhart, age 30, birthplace Tenn.
George Gayhart, age 40, birthplace Tenn.
Isabella, age 19, birthplace Tenn.
Lenora, age 17, birthplace Tenn.
Nancy, age 15, birthplace Tenn.
James, age 13, birthplace Tenn.
Valentine, age 11, birthplace Tenn.
William, age 8, birthplace Tenn.
Mariah, age 5, birthplace Tenn.
George W, age 3, birthplace Mo. Isabelle, age 28, birthplace Tenn.
S.M. (female), age 9, birthplace Mo. My father William, died at the time the Federals burned Celina,Tn.. He is buried on Hugh (Hughie) Robert's place (his father-in-law?) south of Celina. My uncle Peter G. married an Alexander near Burkesville,Ky., died in Grayson Co.,Texas, burried at White Mound Cemetary in the 60's. The maiden name of the wives of Samuel G. and Valentine G. was Smith. Sisters of Henson Smith. Abraham G. married Nancy Harris, daughter of Sterling Harris of Sugar Creek, Jackson Co.,Tenn. She had one brother William father of Marion Harris a minister. George W. Gearhart, the youngest, married *Sarah Roberts, daughter of Jimmie (James) Roberts of Tinsleys Bottom. Aunt Edith G. married John Nevins; Aunt Ruth G. married Charles Davis. My mother's maiden name was *Sarah Roberts, daughter of Hughie Roberts. *(Were Hugh & James Roberts brothers? Both named a daughter Sarah; the girls were close in age) Her mother's name was Sarah Davis, she was the Sister of Billie Davis of Mitchell's Creek on Obey's River. Matthew tommie,,Billie,Jacob,Benjamin and Johnathan Davis were her brothers. They had other sisters, one who married a Stone and was the mother of Suckie (Stone) Davis, wife of Issac Davis. Another married a Roberts. She was the mother of Nancy (Roberts) Smith wife of Mordicai Smith and mother of Matt Smith. Malthia Davis was a sister of Nancy Smith. My mother had two brothers, Jefferson Roberts and Johnathan Roberts. Three sisters; Susan, Nancy and Mary. Jefferson married Baskie Stone daughter of Billie Stone. Johnathan married Jane Mahoney of Gainesboro,Tenn. Susan Roberts marrried Franklin Coldwell of East Tenn. Nancy Roberts married Henderson Coldwell, half brother of Franklin. Mary Roberts married Sib Stone a son of Billie Stone. Peter GEARHART moved to Franklin County, Virginia in 1779 from Pennsylvania. The Franklin County Early Settlers Map show his land being adjoined by that of Lewis Deweese, John Willis, Peter Sander, William Cook, and Robert Jones. This parcel of land was in Henry County in 1779 and later became a part of Franklin County, and lies on now state route 640, generally across from Ebzender Baptist Church. In Oct. 1779 Peter Gearhart purchased a tract of land from Cornelius Deweese, containing 110 acres in Botetourt County, Virginia. This land later became a part of Montgomery County. This parcel lies in the southwestern tip of Montgomery County on Laurel Creek, a branch of the Little River. This land became the property of William Deweese sometime between 1782 & 1787. THE LAND OFFICE IN RICHMOND, VIRGINIA; DEED BOOK A, PAGE 16: To PETER GEARHART, 20 Oct. 1779, 343 acres on the head of Hatchett Run and Pounding Mill Branch, waters of the Pigg River. In the Henry County Surveyor's Book 1: this land is listed as Peter Geereheart and Lewis Deweese, joint owners. HENRY COUNTY COURT - 13 SEPT. 1783: Peter Gearhart was awarded 20 pounds for having a mare for public use. This mare was taken by the command of Col. Hugh Crockett, and used in marching to the assistance of Gen. Nathaniel Greene at the Battle of Guilford Courthouse in North Carolina. (Now Greensboro) Gen. Greene was defeated 15 March 1781 by Gen. Cornwallis. FRANKLIN COUNTY COURT - DEC. 1786: Peter Gearhart was paid for making two pairs of handcuffs for the county. FRANKLIN COUNTY COURT - JUNE 1788: Peter Gearhart was appointed as surveyor of the road from Blackwater River to Pigg River, in the place of Joshua Rentfro, and the list to be filled, be his gang. There are many times in Franklin County court records that Peter Gearhart is listed as being on juries and grand juries. In the name of God Amen. I Peter Gearhart of Franklin County, State of Virginia, Blacksmith, being advanced in years and weak in body but sound and disposing mind, memory and understanding, calling to mind the mortality of my body and soul, it is appointed for all men to once to die, do see cause to make my last will and Testament, that is to say, principally and first, I command my sole to God, and my body to the grave to be buried in a Christian like manner at the discretion of my wife and Executors, and as touching such worldly goods wherewith God bestowed me in this life, I dispose of the same in the following manner and from to wit, it is my will, I do order that all my lawful debts, funeral expences, and Doctor Charles shall be paid and lawfully discharged. I will and bequeath unto my wife, Margaret Gearhart all my stock, household furniture and farming tools during her widowhood, except what I shall hereafter bequeath to my daughter Susanna. I will and bequeath unto my fours sons that is -- Peter, Felty(Valentine), William, and Thomas, fifteen pounds each, to be paid to out of my cash, and the balance thereof to let on interest for the use of my wife, which with my slaves she shall have during her widowhood. I will and bequeath unto my fours sons, Peter, Felty, William, and Thomas, all my sons after my wife's decease or alter her name, to be divided equalty between them. I bequeath unto my daughter Susanna as much property before any sale or division is made, as any of my daughters that are married has had, when she is married, or of lawful age. I bequeath unto the heirs of my son Henry Gearhart, deceased, five shilling cash, to be paid to them on demand by my Executors (whom i shall herewith nominate) it is my will, and I do order that all my available property and my slaves shall be sold by my Executors after my wife, decease or marriage, and the price thereof to be divided equally between my children, that is Leonard, Christian, Mary, Peter, Felty, Hanna, William, Thomas and Susanna; and I do hereby nominate and appoint my beloved sons Peter Gearhart and Felty Gearhart, to be my executors of my last will and testament giving them full powers and authority to act, do, and cause to be done and everything, or things inserted in my last will and testament. In witness whereof I Peter Gearhart hereunto set my hand and seal, this twenty forth day of April, in the year One Thousand Eight Hundred and Two. Franklin County CourtHouse the 6th. day of September 1802 The last will and testament of Peter Gearhart. deceased. was proven by the oath of John Song and Jacob Prillamorn two subscribing Witnesses and ordered to. ON the motion of Peter Gearhart and Felty Gearhart, the Executors herein named, who made oath, and together with Daniel Prillamorn and Isaiah Willis their securities entered into and acknowledged their bond in the penalty of three thousand dollars conditions according to the law Certificate is granted them for obtaining a probate in due form. Inventory and appraisement of the estate of PETER GEARHART, SR., dec'd, taken Jan. 20, 1803. Items mentioned include: Negroes Will, Sealey, Fanny, Salley; 17 cattle, 4 stands bees, 1 set smith's tools, crops of wheat, rye, oats, & flax; 2 compasses, 1 large pocket book, 7 Dutch books, 7 English books, 1 looking glass. Total valve 460# 19 shillings 1 pence. JAN. 20, 1803. Agreeable to an order of Court, we appraised the estate. Signed: SHORES PRICE, SAMUEL HAIRSTON, THOMAS JONES. Amount of sales & c. of part of the estate of PETER GEERHART dec'd, which was conducted by Peter and Valentine Geerhart, executors. Purchasers were: Leynard Geerhart(? ), William Wilson, Jacob Prilliman, Jesse Deweese, Peter Geerhart, Alexander Whyley, Abraham Nafe, Valentine Geerhart, William Hickmond, Robert Henry, Thomas Geerhart, James Paden, John Long, Joseph Willis, Joseph Davis, Isaiah Richards, James Welch, Joseph Quiqley. Total of sales: 63# 16 Shillings 9 Pence. Account of the sales of part of the estate of PETER GEARHART, deceased, made by MARGARET GEARHART on September 23, 1803. Total sales: 56# 19 Shillings. Signed: Peter Gearhart, Valentine Gearhart, Executors. Many thanks to Jeanette and Carol Gabbert for providing much of this information. Also referenced is the book Ozark Heritage (1851-1878) Volume I published by the Dent County Historical Society. The raw research data is available HERE.